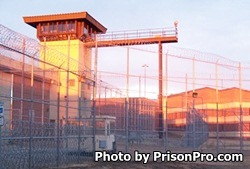 Located in Bismarck, North Dakota State Penitentiary is a maximum security prison that houses 1,550 inmates. The facility is comprised of seven units; the North unit, East unit, West unit, South Unit, Segregation unit, Overflow unit, and the Treatment unit. Each unit houses a certain type of offender and is specialized to attend to the specific needs of the inmate. The North unit is where orientation and reception inmates are first housed. During the orientation and intake process the facility will assess and test the inmates mental ability, mental health, physical and medical needs, and evaluate any treatment programs the inmate may require. Most inmates in the North and South units are housed in double bunked cells. Inmates housed at North Dakota State Penitentiary can receive alcohol and substance abuse treatment during their incarceration. Offenders may also participate in group therapies, anger management courses and programs designed to change behavioral patterns. Vocational training and educational programs are also available at North Dakota State Penitentiary.